In an effort to help feed the virtual world as quickly as possible (while earning as many tips as possible), Daniel Navarro has developed an app called Spanish Chiringuito, a time management game reminiscent of Diner Dash and Sally’s many shops. The premise of the game is familiar to those that have played the aforementioned games. Customers show up with an order, you make it as quickly as you can, and they tip you accordingly as they leave. The order pops up in the form of a pictorial speech bubble; tap the glasses on the left for drinks, and the fryer and the pan (on the right) for foods. The options will show up on the very bottom, and you can tap and drag them onto the gray tray. Then you must bag the order and deliver it to the customer–tap above the tray and the bag will appear, then drag it to the customer who ordered it. Of course, just like in the real world, customers aren’t going to show up one by one…they’re going to pop up in droves. If you’re not fast enough to fulfill an order, they leave angry, and you have lost potential revenue. There are 15 levels to unlock, and orders will get more and more complicated as you progress. And with 25 different products, there’s a lot of different combinations you can put together. As an added bonus, you can also unlock 12 “recipes,” which I put in quotations because they’re mostly descriptions, from what I’ve seen. 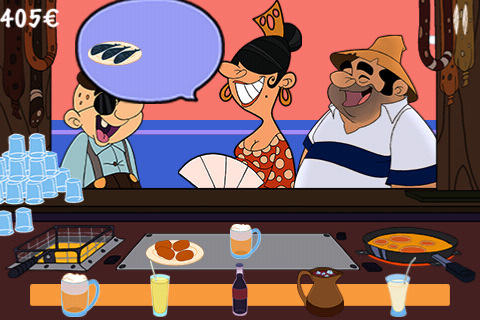 Spanish Chiringuito is a fun little game, but other than the food culture, it doesn’t exactly bring anything new to the table. The graphics are bright and amusing (keep an eye out for the alien), and I really enjoyed the soundtrack and background noises, which brought to mind a seaside shack. Reading through the descriptions of the different kinds of food you’re supposed to be serving is entertaining, but not exactly worth playing to unlock. For $1.99, you could probably find a better way to spend your time. AppSafari review of Spanish Chiringuito was written by Julie Guan on June 13th, 2010 and categorized under App Store, Fun, Games, Time Management. Page viewed 3317 times, 1 so far today. Need help on using these apps? Please read the Help Page.